Standing before Cook County Circuit Court Judge John Fitzgerald Lyke, Jr., Smollett appeared to remain steadfast in his refutation of the felony charge against him. He has repeatedly insisted that the attack was real and that he was merely a victim, not a perpetrator. If convicted of felony disorderly conduct for filing a false report, the actor faces up to three years in prison. When first assistant state attorney Risa Lanier told Lyke that the actor had picked up two brothers who authorities say carried out the staged attack on him at his direction and showed them the location of where he wanted to be attacked, Smollett shook his head in disagreement. When Lyke told Smollett that the allegations, if true, are "utterly outrageous," the actor nodded his head in agreement -- doing so again when Lyke said the noose detail would be the most despicable part of the alleged scheme. The judge also ordered pre-trial monitoring of the actor, and ordered him to stay away from the two brothers he allegedly conspired with to stage the hoax attack, according to police. Smollett's next court appearance is scheduled for March 14. The tense courtroom appearance followed on the heels of a morning press conference at which a visibly angry Johnson castigated the actor for betraying his race and his city with such an incendiary false claim. "Jussie Smollett took advantage of the pain and anger of racism to promote his career," a visibly angry Johnson said. “I am left hanging my head asking ‘why?’. Why would anyone, especially an African-American man, use the symbolism of a noose to make false accusations? ... How can an individual who's been embraced by the city of Chicago turn around and slap everyone in the city in the face with these false claims?" In addition to staging the attack, officials said, Smollett also sent himself a hate-filled letter to the Fox studio where the hit show is filmed. Smollett turned himself in at 5:15 a.m. local time and made a statement to police before being taken into custody. His lawyers, Todd Pugh and Victor Henderson, were not present at the time but they released a statement the night before. "Like any other citizen, Mr. Smollett enjoys the presumption of innocence, particularly when there has been an investigation like this one where information, both true and false, has been repeatedly leaked. Given these circumstances, we intend to conduct a thorough investigation and to mount an aggressive defense." Thursday evening, the attorneys released a statement criticizing law enforcement's handling of the case. "Today we witnessed an organized law enforcement spectacle that has no place in the American legal system. The presumption of innocence, a bedrock in the search for justice, was trampled upon at the expense of Mr. Smollett and notably, on the eve of a Mayoral election," the statement read. "Mr. Smollett is a young man of impeccable character and integrity who fiercely and solemnly maintains his innocence and feels betrayed by a system that apparently wants to skip due process and proceed directly to sentencing." Jussie Smollett attends an "Empire" event in Los Angeles, May 20, 2016. Police add that Smollett gave no statement to police after turning himself in and that his lawyers had reached out to them Wednesday night to discuss his surrender. Smollett wanted to turn himself in near midnight, but authorities suggested he come in at 5 a.m. instead, to avoid spending the night in jail. Smollett arrived early Thursday morning accompanied by a female lawyer and an entourage of five or six people. Smollett was silent as he went through the motions of being booked and processed. By late morning on Thursday, the backlash against the actor began at the top, with an angry tweet from the President of the United States. ". @JussieSmollett - what about MAGA and the tens of millions of people you insulted with your racist and dangerous comments!? #MAGA" President Donald Trump wrote in a tweet after the press conference. 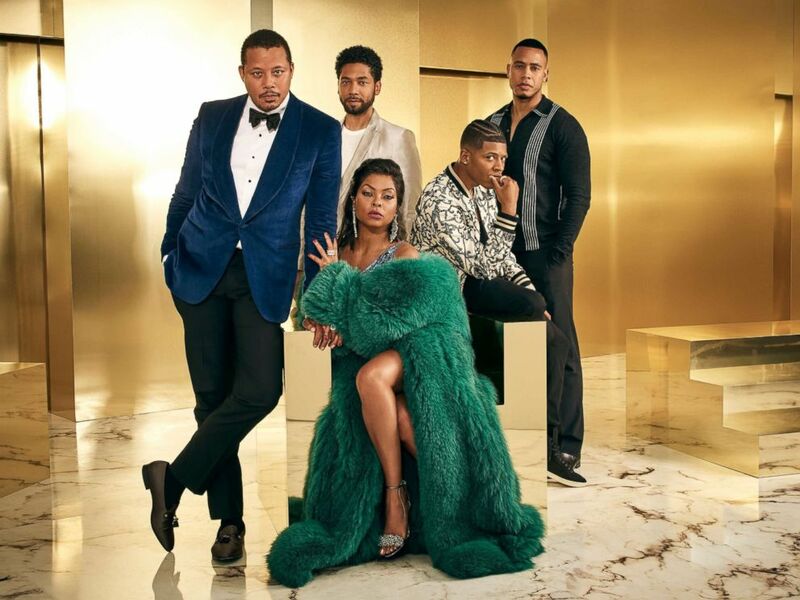 The cast of "Empire," Terrence Howard, Jussie Smollett, Bryshere Gray, Trai Byers and Taraji P. Henson, pose in a promotional image for the program. In an earlier interview with ABC News, Smollett was asked why he thought he was targeted and he replied that he is a strident critic of the Trump administration. During a press briefing later Thursday morning, Chicago law enforcement officials said that Chicago police detectives interviewed more than 100 people and reviewed dozens of police cameras trying to get to the bottom of Smollett's claims. How can an individual who's been embraced by the city of Chicago turn around and slap everyone in the city in the face with these false claims? Johnson, a well-regarded and popular big city police chief and Chicago native, appeared genuinely aggrieved as he described how, he said, Smollett took advantage of the pain of racism to advance his career. "Why would anyone use the symbol of a noose" to further his "own public profile," Johnson wondered aloud. "I'm offended by what happened and I'm angry," Johnson continued. "This publicity stunt was a scar that Chicago didn’t own and certainly didn’t deserve." Johnson, who oversees one of the nation's largest police departments in one of its most violent cities, seemed disheartened by all the attention paid to the Smollett affair. “The accusation within this phony attack received national attention for weeks,” Johnson told reporters during a press conference. “Celebrities, news commentators and even presidential candidates weighed in on something that was choreographed by an actor." 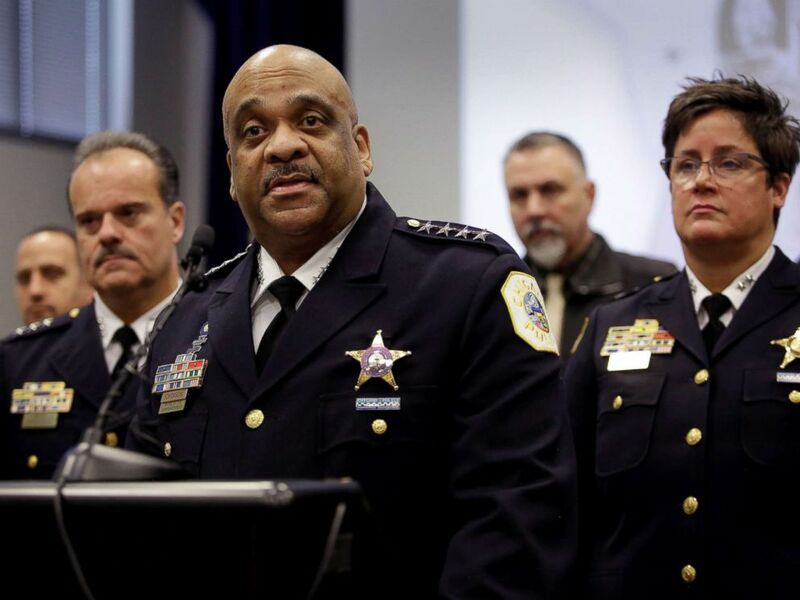 Chicago Police Superintendent Eddie Johnson speaks about the Jussie Smollett case at a news conference at Chicago Police headquarters in Chicago, Illinois, Feb. 21, 2019. "When you get the opportunity," he said with a mixture of derision and frustration, "the shooting victims and their families? Give them the same amount of attention." After the press briefing, 20th Century Fox, the station that airs "Empire," released a statement which read, "We understand the seriousness of this matter and we respect the legal process. We are evaluating the situation and we are considering our options." Smollett told police he was attacked by two masked men near his apartment in Chicago. 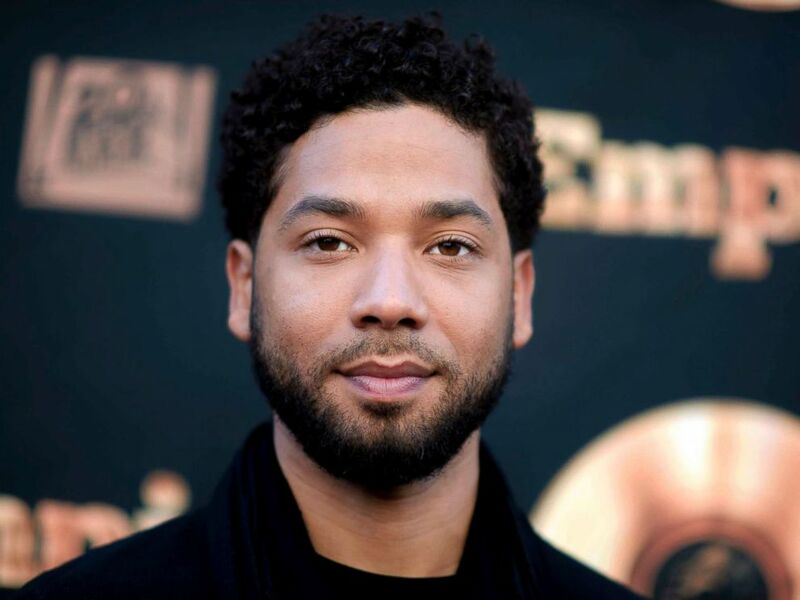 The two men, Smollett initially said, shouted racist and homophobic slurs at him as a rope was wrapped around his neck and a chemical compound was poured on him. The alleged assailants yelled "MAGA country," a reference to President Donald Trump's "Make American Great Again" slogan, police were told. Chicago trusted this young man. We loved 'Empire,' and we took this very seriously that something this hateful could happen in our city. In an interview with "Good Morning America" anchor Robin Roberts, Smollett said he was heartbroken when he found out that people questioned his story. Asked why he would leave the rope draped around his neck until police arrived because he "wanted them to see." Jussie Smollett is pictured in a police mugshot after being charged with making a false police report. "I was looking at myself, just like checking myself out," he told Roberts. "I saw the bruise on my neck, you know, like the little -- the rope burn around my neck. So when the police came I kept the clothes on, I kept the rope on me. ... I mean, it wasn't, like, wrapped around. But, yeah, it was around because I wanted them to see." Asked why he wait until the second interview to tell police that the assailants yelled “MAGA country” at him during the attack, Smollett seemed to take offense at the insinuation. "For me, the main thing was the idea that I somehow switched up my story, you know? And that somehow maybe I added a little extra trinket, you know, of the MAGA thing," Smollett said on ABC News. "I didn't need to add anything like that. They called me a f----, they called me a n----. There's no which way you cut it." Johnson said on Thursday that Smollett's seeming injuries from the incident also appeared to be phony. “The brothers had on gloves during the staged attack where they -- they punched him a little bit, but as far as we can tell, the scratches and bruising that you saw on his face was most likely self-inflicted." Police identified and questioned two "persons of interest" captured on surveillance video near the scene around the time of the alleged attack. The men, who are brothers, were arrested on Feb. 13 but then released without charges, with police saying they were no longer considered suspects. While being questioned by investigators, the brothers claimed that Smollett paid them to help orchestrate and stage the crime after he became upset that a letter threatening him, sent Jan. 22 to the Fox studio where "Empire" is filmed, did not get enough attention, sources told ABC News. 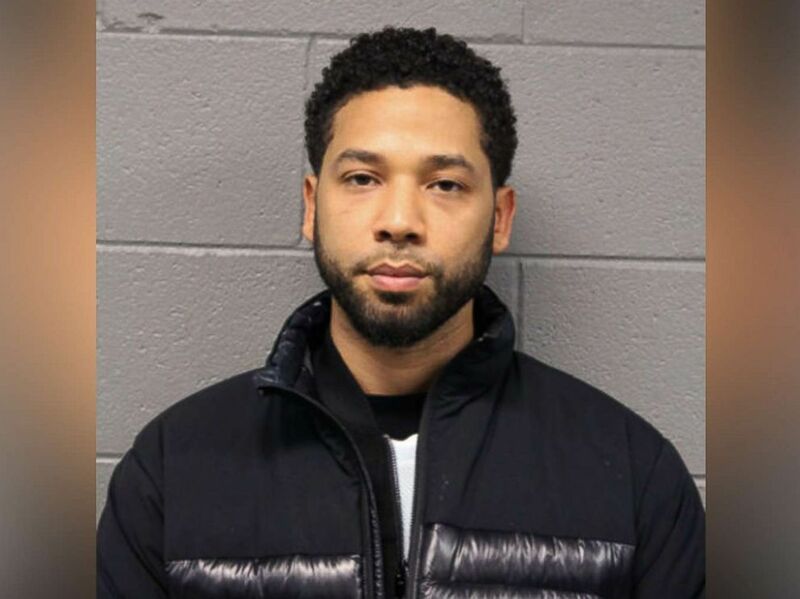 On Wednesday, Smollett was charged with felony disorderly conduct for filing a false crime report. By that evening, police officially had classified the actor as a suspect in the ongoing investigation. Detectives subsequently presented evidence to a Cook County grand jury. "That was a pretty hateful allegation, and it really put a terrible look on Chicago," Guglielmi told ABC Chicago station WLS in a telephone interview Thursday morning. "Chicago trusted this young man. We loved 'Empire,' and we took this very seriously that something this hateful could happen in our city." ABC News' Monica Escobedo, Andy Fies, Will Gretsky, Michael Rothman and Morgan Winsor contributed to this report.